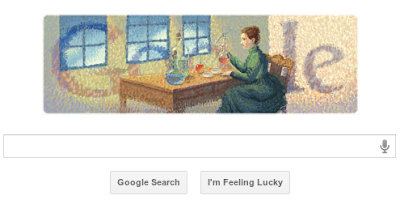 Today, Google is showing a Doodle for Marie Sklodowska Curie (7 November 1867 – 4 July 1934), the woman who got 2 nobel-prizes for the research about radioactivity. The measuring unit "Curie" is named after her. The Doodle marks her birthday. She was born in Warsaw, Poland. A Doodle worth mentioning, for a scientist beyond worth mentioning.